Ruby Belle is a true lovebird that loves to be heard! This gem of a bird loves to sing her heart out! 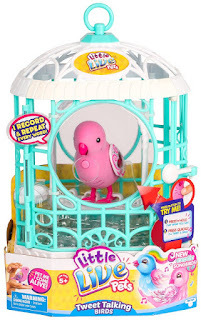 She can make 30 real bird noises and loves to sing you an exotic song, as well as being able to record and repeat what you say! Carry her anywhere in her beautiful cage. It's like her own portable stage! Little Live Pets are the pets without the mess!